Connect your UptimeRobot monitoring checks directly to components on your status page to control the status automatically. 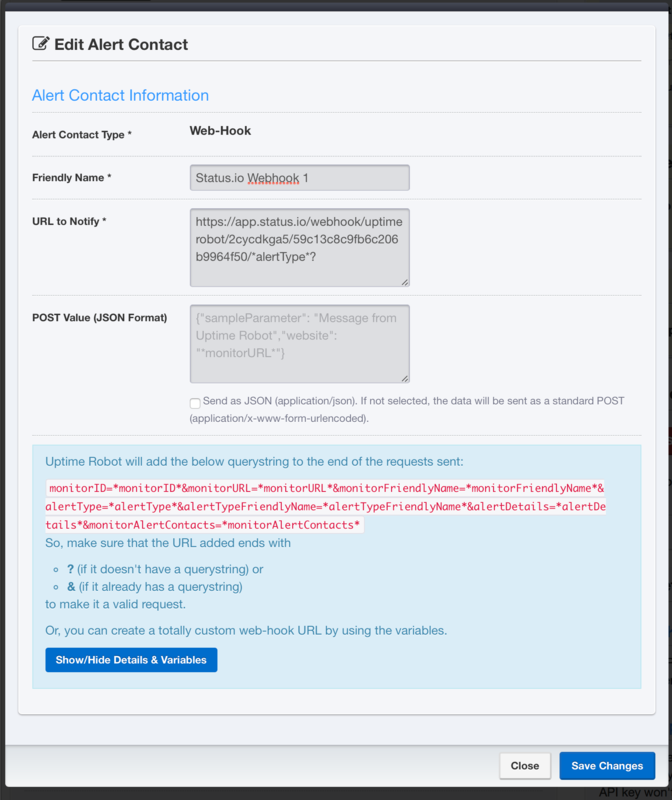 We integrate with UptimeRobot using up/down alerts. An UP event will cause a component to be operational and a DOWN event will be displayed as a service disruption. Notifications are not sent for UptimeRobot status updates. Login to Status.io and choose the Infrastructure tab. Copy the UptimeRobot webhook address for the appropriate container. Login to UptimeRobot and select My Settings. Scroll down to the Alert Contacts section. Click Add Alert Contact and choose Web-Hook for the contact type. Insert the webhook address from Status.io in the URL to Notify field. Select the monitoring check to link to Status.io. 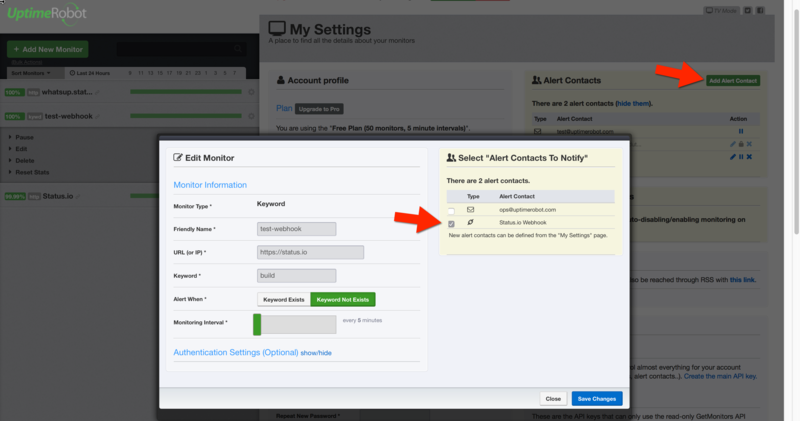 Check the box for the new webhook contact you just created. That’s it! Your UptimeRobot check is now connected to the component/container on your status page. 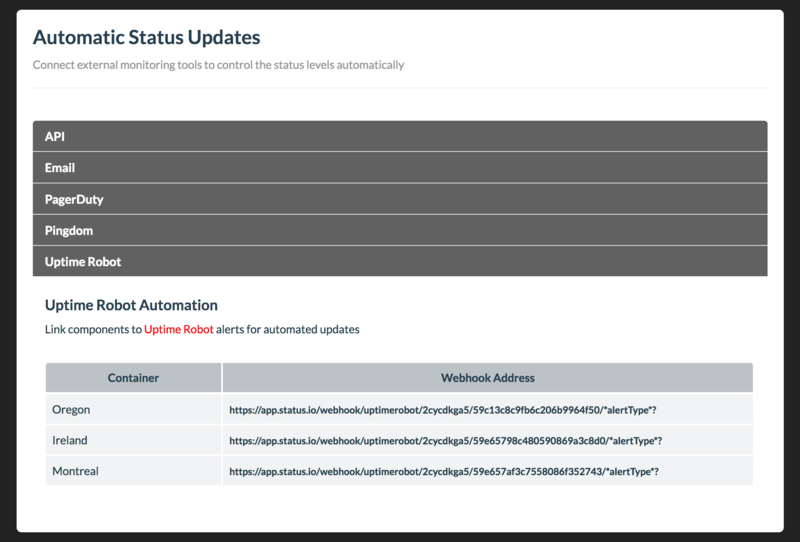 Check the Recent Activity of the component to see when UptimeRobot changed the status automatically.